For the past few years, Cory Christopher has inspired me into attempting holiday decor designs at home after attending his Do-It-Yourself (DIY) decor sessions at Christmas in November at the Fairmont Jasper Park Lodge. Cory, who is like a Christmas elf with a green thumb, manages to whip through about 15 projects in the 75 minute class using an assortment of fresh florals, second-hand books, and home accessories from everywhere from the storage closet to the dollar store and Canadian tire. It is exhausting and inspiring all at the same time. If you follow Cory’s Instagram account, it is hard not to be inspired by the beautiful floral bouquets, succulent displays, and wedding theme photos he and his team create around the province of Alberta. Thankfully, Cory offers a chance to recreate his bouquets through his hands-on fresh floral workshops at his studio in Edmonton and at his family farm north of St. Albert. Cory recently invited me to attend a dahlia workshop at his family homestead at Birchwood Meadows in Sturgeon County. My friend Kelley joined me for the class, which included an intro to dahlias with Cory, followed by the opportunity to hand pick an assortment of flowers, herbs, and foliage for our one-of-a-kind bouquet. Cory explaining the layout of the garden and which flowers we could collect for our bouquets. Cory showed those of us who were scared to make the first cut how far down to cut the dahlias on the stem. We were invited to use the sunflowers in our bouquets, but some were too high to reach. Once we returned from the field, we took a seat at a long table in the garden. With a little guidance from Cory on how to size, layer, and build our bouquets – each of us created a unique dahlia display to take home. Kelley’s bouquet featured white flowers – classic and beautiful just like her. Kelley and I were both ecstatic to go home with our beautiful bouquets. Cory had invited me to attend so my class was complimentary, but after experiencing his hands on workshop, and the opportunity to pick our own flowers on the farm, I think his course is great value and I look forward to registering with Kelley for another one soon. 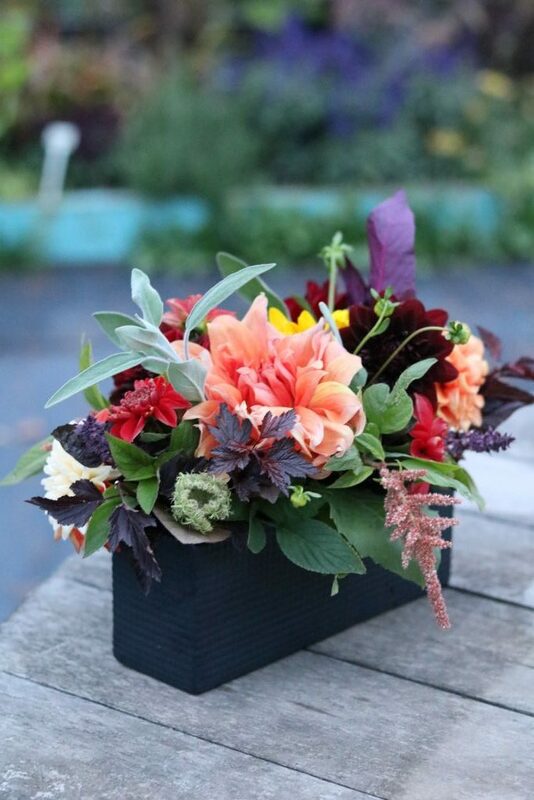 Upcoming workshops include this weekend’s Thanksgiving Floral Centrepiece at Birchwood Meadows and a Terrarium Design Workshop at Burnwood Distillery in Calgary. Stay tuned for upcoming workshops – grab a friend and get creative with Cory Christopher – your table will never look better!